The park is lovely, and the renowned playground is a great venue if you're looking to entertain kids with pent-up energy in central Paris. I'd been meaning to take T to the playground in the Jardin du Luxembourg for a while now, and Boxing Day - with my sisters still immersed in their new books and DVDs - proved a perfect opportunity for a H-T-me outing. Even in winter, with bare trees and sparse vegetation, the park is appealing. 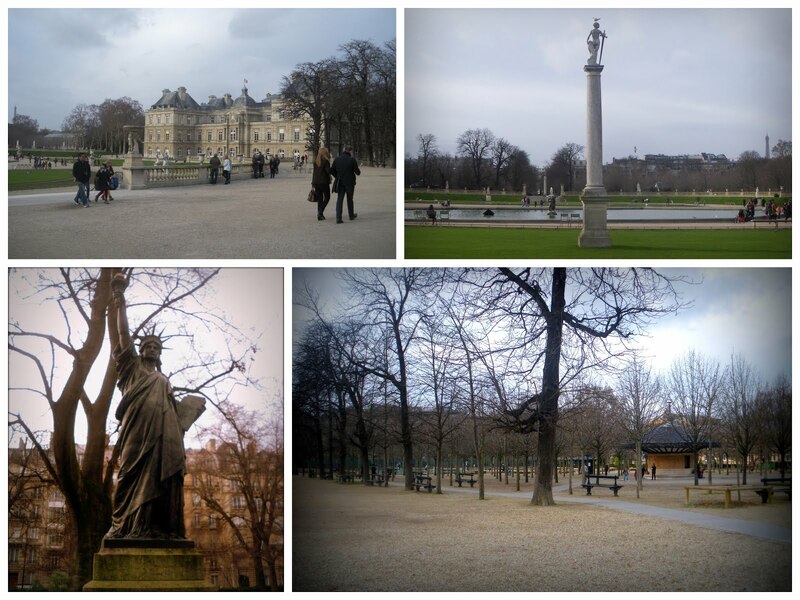 Though I find the jardin à la française layout slightly stiff, it's suitably imposing and Luxembourg Palace (seat of the French Senate) makes a fitting centerpiece and practical example of how historical buildings can serve a modern purpose without being turned into museums. Overall, it's a charming and pleasant environment: families were floating boats in the basin and statues of various eras and styles are tucked away in almost every corner. T was especially taken by a smaller-scale version of the Statue of Liberty (not to be confused with the others in Paris). ...while the main attraction in the older kids' section seemed to be a pretty impressive zip line. The fence is high enough to keep dogs out and little adventurers in; there's only one (supervised) way in and out; and there are washrooms on the premises (not the cleanest, but serviceable). The entry fee - €1.20 per adult; €2.50 per child - is reasonable for what's on offer, especially since tickets are valid for the whole day. The playground is well-signposted and easy enough to find within the park, about a 10-min walk from Luxembourg RER station with a toddler in tow. Ultimately, though, I don't think there's anything special about the playground. I'm probably spoiled because we're lucky to have two (free) playgrounds within a 10-minute radius of home which are safe and have great equipment for the 10-and-under crowd. So for us (and other Paris residents with good playgrounds nearby) there isn't really any reason to trek to the Jardin du Luxembourg just to go to the playground. As it was, T happily spent over an hour monkeying around and we would have stayed longer if I hadn't gotten cold. T was in a mood for more exploring after the playground, so we decided to explore the 6th a bit more before heading back home. Drawn by the Christmas trees in front of the arrondisement's city hall, we spent the next while at the Place Saint-Sulpice. T loved looking at the fountain but liked the (large, well-maintained) carousel even better. 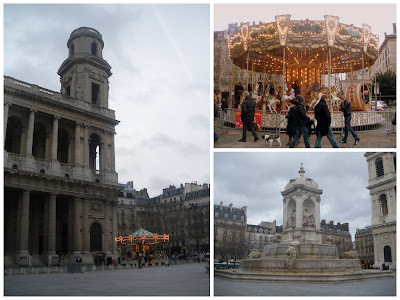 We were in luck because the rides were free - a Christmas gift from the city of Paris to residents and visitors.